Traditionally, India has four Kumbh Melas. The Sangh has just created a fifth in Dangs with the sole aim of scaring off Christian missionaries in the region. The Shabari Kumbh Mela calls out to everyone. — From a promotional video for the Vishwa Hindu Parishad’s Shabari Kumbh Mela in Dang, Gujarat. Sounds like a call for religious war? It may well be. A targeted communal attack disguised as a holy festival. For the first time in history, the VHP has created a fifth Shabari Kumbh Mela in Dang district. The festival is being used to build tension and intimidate Christian Adivasis in this isolated forest region in south Gujarat. For several years, the local VHP leader Swami Aseemanand has led a vicious campaign against Christians here. In 1998, there were 38 attacks on Christians in a span of three weeks. Since then, the Sangh has worked to create hostility towards them. The Shabari Kumbh Mela is one more step in that direction . The propaganda on their website and in their promotional video clearly states that the event is meant to fight the influence of Christianity in this area, and ‘awaken’ Hinduism amongst tribals. “Hindu jaage, Christi bhaage (Hindus awake, Christians run)” is the slogan used here. And the strategies of oppression are very systematically planned. In 2002, they invited the sant Morari Bapu for a Ram Katha. In his speech, Morari Bapu said that there should be a Kumbh mela here at the place where Lord Ram met Shabari. The Sangh has been propagating the myth that Lord Ram met his adivasi follower Shabari here, and ate the wild berries that she tasted. However, there is no historical evidence, nor is there any religious precedent of a Kumbh mela here. For centuries, there have been only four Kumbh Melas. Suddenly, a fifth one has been started based solely on Morari Bapu’s declaration. And with a clear intent to intimidate. From 11th to 13th February, the Sangh plans to get more than five lakh pilgrims for this event. The total population of Dang district is just a little over two lakh, almost entirely adivasi. So, the entire district will be swamped with the Sangh’s supporters. The event is being marketed in cities of neighbouring states as a new religious tourism destination. Jarsol Dahad, a small pond in Subir village has been re-named ‘Pampa Sarovar’, the place where Ram met Shabari. A place that has seen no development for decades is suddenly awash with funds. The government has built 12 check dams to make sure there is enough water in the ‘Pampa Sarovar’ for pilgrims to bathe. Village roads are being tarred. Piped drinking water and electricity is being brought to places where there has been none so far. Tents, water tanks and toilets are being put up in farmlands, paying villagers a mere Rs 300. If people are not willing to rent out their land, local officials intervene on behalf of the Shabari organizers. Forty temporary townships, to accommodate 5000 people each, are being constructed. Surrounding villages have been swamped with Sangh activists preparing for the mela. In Subir, they distribute free meals, grains and clothes to villagers. Activists are visiting villages to mobilise supporters. They are intimidating Adivasi Christians and taking photographs of their homes and of Christian institutions like schools or dispensaries. On the local Akashvani is broadcasting Morari Bapu’s speech every evening. Audio-visual vans tour the villages, screening the promotional video and the Ramayana TV serial. In villages, the atmosphere is tense. People refuse to speak about the mela. Rumours are rife that Christians will be attacked. All signs of planned disaster repeated before most communal attacks. Threats began many months earlier. Shimbuben Powar (name changed) was filling water when Sangh activists came to her home a few months back. “My little son was home. They entered my house and tore the picture of Jesus. I rushed back. They told me, ‘If you don’t follow Ram, you will be finished in the Kumbh Mela. Even the police won’t save you.’ They took photographs of me and of our house,” she says. When Shimbuben reported it to the police, they took down the names, but did not lodge a complaint. Earlier this month, some women came back to her home and told her to leave Jesus and follow Ram. The newly constructed Pampa Sarovar and Shabari Dham temple are both built on land grabbed from Adivasis, villagers allege. The Shabari trust has snatched Sonu’s land near the ‘Pampa Sarovar’. The government has done nothing to stop them. Instead, villagers allege that it is assisting the land grab. “Government officials came and surveyed my land. They said they wanted to find out how much was mine and how much was protected forest land. I told them that I have the title deed as proof,” says Sonu Powar. But they didn’t listen to him. They have let the land be used as a tourist spot. “The swami’s supporters fought with me and told me to give the land to the swami. They even filed a police case against me for fighting with a shopkeeper.” If the land is protected forest, then why is the government turning it into a tourist playground? Manad Powar had 3.5 hectares of land on a hill known as Chamak Dongar (shining mountain). When the Shabari trust wanted to build a temple there, they asked Manad to sell one hectare for Rs 40,000. But they captured all his 3.5 hectares of land. “I still have title to the land. But now, if I go there, the security guards threaten me. I am alone here, my sons work in the cities. I can’t fight them. They even cut 100 trees which I had planted to make a road to the temple,” says Manad. “They made my cousin a member of the Shabari trust, and claim the land is in his name.” Manad is now planning to fight his case in court. 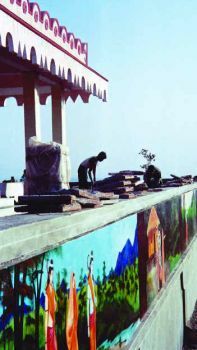 But the government’s only response to the upheaval in the district has been to expedite all work connected with the Kumbh. 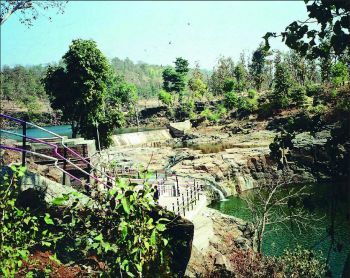 District collector R. N. Jadhav estimates that development works worth Rs 3 to 4 crores has been spent on the building of the check dams, roads and pipelines. “We would have done it anyways even if the Kumbh was not there,” he says. Jadhav assures that there will be no trouble during the mela. When asked why no action has been taken even though the Kumbh’s promotional video spews anti-Christian propaganda, he says, “I have not received any complaint, so why should I take any action?” Meanwhile, human rights groups have filed a case in the Supreme court asking that minorities should be protected considering the hate propaganda that is being spread. The Sangh’s promotional video warns that the rate of increase of the Christian population in Dang has grown four fold. 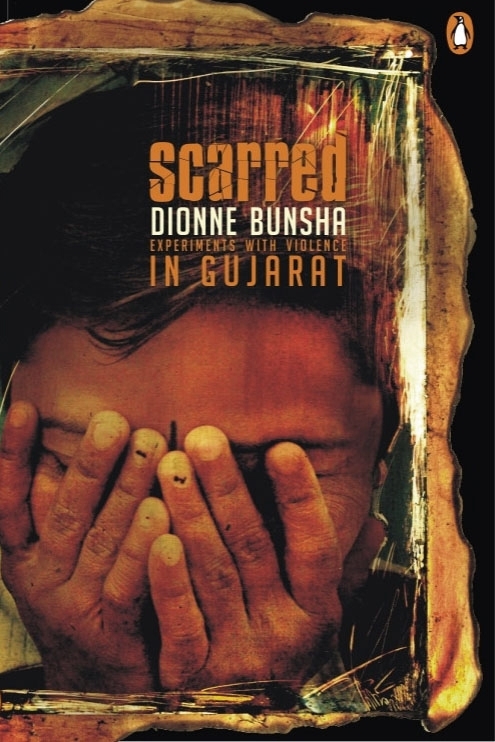 It points out that Christians constitute only 0.44% of Gujarat’s population, but are 5.43% in Dang. “History has shown us that places where the Hindu majority has weakened have become hotbeds of terrorism and anti-national activities,” the video says. The Sangh is generating fear to gain political and economic control of this rich forest area. Even today, money and muscle power are being used to gain support in villages. Bonds between communities are being torn. Contrary to the Sangh’s myth, adivasis are not being forcibly converted. Most turn to the church for health reasons. “My father and me kept falling ill. There was some bad influence on us. We went to the local bhagats who made us spend money on killing one goat every month. Yet, it didn’t work. So my uncle took me to a local Christian priest and I felt some peace. We got better without paying anything,” says Ramesh (name changed). While the Sangh wants to ‘re-convert’ Christians, they were never Hindus to begin with. Adivasis have their own festivals and rituals in which they worship nature. Their religious practices are very different from the Brahmanical brand of Hinduism that the Sangh wants them to follow. But regardless of facts, the myths continue to be propagated. The show will go on. The swamis and Sanghis are all set to take Dang by storm next month. It may not be as innocuous as just a dip in the pond. Wat a crab. Dear history is evident of what chritians has done in India. Lets go to 1745 when after defeat of Marathas britishers were quiet satisfied that their success is evident in India but the only fear was bhramnic culture (Hinduism) as a result Bodons School of sanskrit was started at Oxford to defame Hindu Texts. Jhon Muir use to gave pound 200 to each blashfaming article on Hinduism. What do you talk Dionne dear. Hinduism is the only religion in the world that is the most tolerant and truely devoted to divine. In India you will still found a thousands of people who dont say but actually believe and lead a life as per text and not like christianity where 90% of people are hypocrate in saying something and doing something. Tell me Bible says “You Shall Not KIll” Why you then kill so many living beings for your feed…ok leave food why thousands of people were killed by missionaries in Spain who refused to convert. Bible says “You will not commit adultery” and see surprisingly you will find highest sexuality in christian countries. Dear Dionne being a hindu we are more staunch belivers of Christ than christians are because we live on what christ wished for his followers and not burden him taking false refuge unto him. We have no reason to believe wat you say. I might not comment on the line say that RSS assumes all tribal as Hindus. If someone claims that they are not Hindus then they are definitely not Christians. Now since geographically there are part of Indian/Hindu culture, their traditions and culture is closer to Hindu (which is more than a religion). The worl history shows that the Christian have destroyed such tribal civilizations in USA, Andaman, Africa and and Australia to an extent that there are no traces of the original people in these parts of the world. Now those who want to differentiate them from the larger class definitely have some non-healthy motive behind it. It might be political and communal. Hence this article is an act of spreading communal violence. Anyway there should not be a difference on opinion that Hindu culture would be a better choice than the christian if someone is starting afresh. Peaceful Christians?????!!!!! – what an oxymoron! My question to you is, were you at Shabrikumbh yourself or did someone told you the story. I personally think you based everything on 50% of the story that someone told you, you did not try to find the other 50% from the other side (hint hint people you are accusing). What a shame being the noble christian you are !!! Always remember when you point one finger 3 fingers point back at you. You are a hypocrat !! !